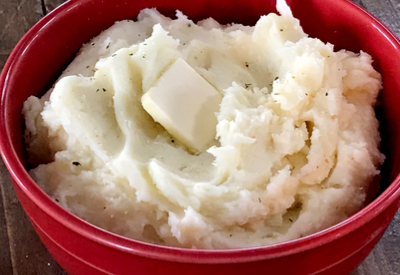 Instant Pot Mashed Potatoes - No More Stove Top Boil Overs! Instant Pot Mashed Potatoes – No More Stove Top Boil Overs! I absolutely love mashed potatoes. There is just something so satisfying when you take a bite of creamy potatoes, especially when served as part of your favorite comfort meal. However, making them on the stove top can be quite frustrating. My family prefers mashed potatoes without peels. So I have become quite a pro at peeling them. I use this Y peeler which helps me to quickly get an entire batch peeled in just minutes. Then you have to watch the pot until it boils, and then continue to watch it so it doesn’t boil over. There is nothing worse than cleaning up boiled over, starchy water on the stove top and on the sides of the pot. Oh and let’s not forget the hot splashing water as you pour the potatoes in a colander to drain. I definitely have gotten several steam facials over the years. Using a steamer basket prevents the potatoes from absorbing too much liquid. So when I decided to try Instant Pot Mashed Potatoes, I was hopeful that all of those issues would be eliminated. My first two attempts didn’t turn out so well. In fact, they turned out like paste. 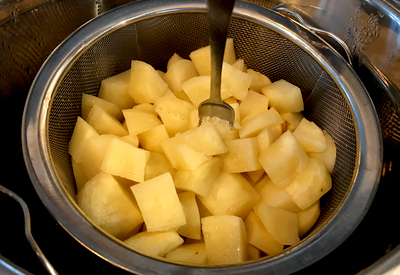 Thinking that I would add more flavor to the potatoes, I originally placed the diced potatoes directly in the pot with chicken stock. I set the timer for 10 minutes, quick released the pressure and drained the potatoes. Everything looked fantastic. However, when I went to use my KitchenAid mixer to whip the potatoes, they ended up looking and tasting like glue. Perfectly tender potatoes ready to be mashed. When I make them on the stove top, I have always put the potatoes back into the hot pot after I drain them to get rid of any extra moisture. This has always resulted in light and fluffy potatoes. So the second time I made Instant Pot Mashed Potatoes, I drained the potatoes, returned them back to the pot on the saute mode. After a few minutes I mashed them again using my mixer. The result – a little better, but they still were not perfect. I was determined to find out the secret to making perfect Instant Pot Mashed Potatoes. First of all, I decided to take the potatoes out of the water and put them in the steamer basket. This prevented the potatoes from absorbing excessive amounts of liquid during the cooking process. Use a fine mesh potato masher to get well mashed potatoes. Secondly, I used a potato masher rather than my stand mixer. Over-mixing can result in the glue like texture. 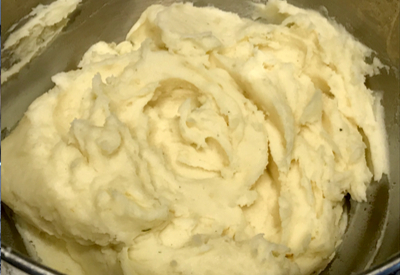 The end result – Light and Fluffy Instant Pot Mashed Potatoes! Now I will never have to worry about my pot boiling over! Now if I could get my family to like mashed potatoes with peels in them! And did you know you can make Meatloaf and Mashed Potatoes and Chicken Noodles and Mashed Potatoes in your Instant Pot as well? This kitchen appliance is a game changer! 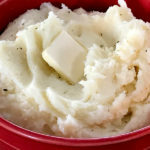 Light and fluffy mashed potatoes made with the Instant Pot Pressure Cooker. In a steamer basket add in the peeled and diced potatoes and garlic. Place the lid on and in the sealed position. Pressure Cook/Manual on High For 10 minutes then Quick Release the pressure. Remove the potatoes and drain the water. 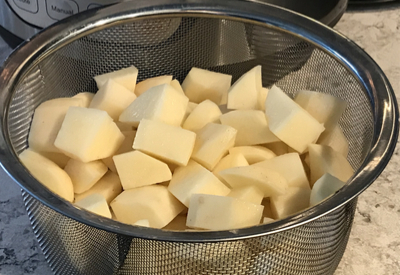 Add potatoes back into the Instant pot and add the butter, sour cream, buttermilk, salt and black pepper and mash with a potato masher. Adjust salt to taste and keep on warm until ready to serve. Serve garnished with chopped chives or parsley, optional.